It all started with a wow airlines sale. The one-way flight to London was LITERALLY $69. I had to book it. So I did… I booked it without a return flight home. Then I started researching and booking more one leg flights. So from London, I booked to Amsterdam ↠ had a layover in Lisbon ↠ Ghana ↠ Egypt ↠ Dubai and finally back home. It was an amazing trip. But as I had booked so many legs of our trip and it was going to be a month long…… we were going to be on a budget. So, I researched, and this is how I did Egypt for cheap. 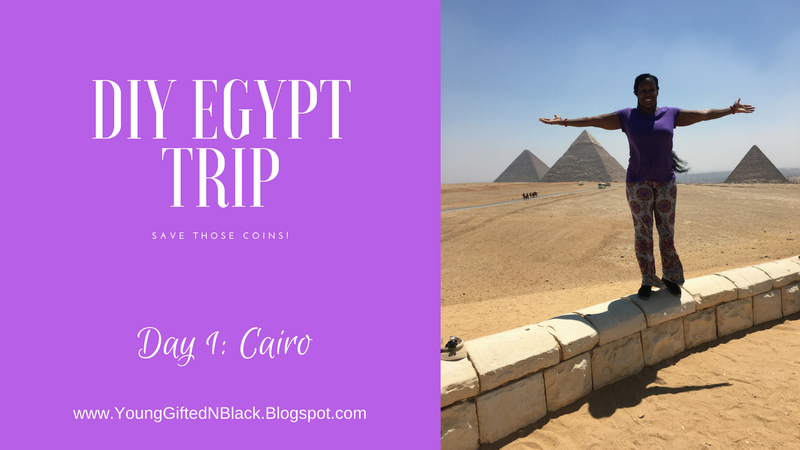 July 2 – Leave Cairo Egypt headed to Dubai! So lets talk about my Do It Yourself Egypt Trip – Day 1 – in Cairo. We arrived in Cairo on the night of June 24. We went through customs, got some money from the ATM (we use capital one 360 banking – so we don’t get charged international or atm fees) and proceeded to leave the airport. Im not a fan of haggling with taxi drivers, so I pulled out my handy dandy UBER app. Yes, uber works in Cairo! (use the link for $5 off your first ride) However, the app lets you know the drivers plates in English numerical numbers, however, the license plates are in ARABIC! So, make sure that you have a lil translation guide. We eventually found our UBER driver and took off on the scariest ride of my entire life. No one uses seat belts, lanes, horns, signals or any sort of organized driving in Cairo. There was literally people running across the major highway. We passed camels etc… but I was most scared of no one driving within the lanes. Needless to say my nerves were tore up and I needed a drink when I got to our hotel that night. We checked into Swiss Inn Pyramids Golf Resortwhich was about an hour away from the airport. But the UBER ride was only like $8. This was a very nice hotel. (we even crashed a wedding). We stayed at this hotel at the beginning of our trip and the end of our trip. Because we had a lot of luggage and we were going to be coming back, they allowed us to leave the items we didn’t need during the week safely stowed with the bellman. This was way better than lugging it all around. Ok, so we got up the next morning and we were picked up by our tour guides for the day. Our tour guide provider was Emo Tours. I booked this full day tour with Emo Tours thru Viator. It was less than $30 per person for me and my husband. Which was an amazing deal. They came as a team: driver and tour guide, and they were both super sweet and the tour guide was really knowledgeable. When we got in the car the driver provided us with ice cold water and local snacks. As our trip was in July, the heat was crazy and that ice cold water was appreciated. Once we got to the pyramids, the tour guide explained to us about their history. We were able to go inside one of the smaller pyramids. Totally cool! (and literally it was cooler inside the pyramid then it was outside). We met his friend who offers camel rides. I wanted to ride the camel, but as I had just had abdominal surgery 2 months prior, I decided it wasn’t a good idea. As we were leaving the pyramids, we were about to skip the sphinx, but I wasn’t having that. The driver pulled over quickly and we got out and I was able to see the sphinx. After the pyramids and sphinx, we went to the Egyptian museum. The Egyptian museum charges a fee for cameras, so I didn’t bring mine in. But hubby got some awesome pictures. We had to rush thru the museum to stay on schedule. But I honestly feel like you could go to the museum for a month straight and still not see everything. Around this time, the Emo tours guides treated us to lunch. I don’t remember what those little meatball tasting things were, but they were so good. I asked them if I could order some more for our overnight sleeper train trip and he was like just take these with you. So we got a take out box, lol. After lunch he asked if we wanted to go to the market. It was hot and I didn’t feel like haggling, so I asked if he knew about any perfumeries. Of course he did! He brought us to this perfumery. I don’t really wear perfurmes, so I didn’t know what I liked. But the gentleman at the perfumery gave us a million options to choose from. I was overwhelmed and gave up. Lol. Hubby ended up getting a small bottle of perfume. The cost was a serious upcharge from subsequent perfumeries I saw in Egypt and Dubai, but I was ok with that because he was patient with us and a great salesman! After our time at the perfumery, it was almost time for us to board our sleeper train to Aswan. So the guys took us back to our hotel, where we picked up our luggage that would go with us for the week and a few beers for the train, lol. It was the last day of Ramadan and I know the guys were eager to get back to the festivities, but they were patient and made sure we got our tickets for the sleeper train and knew which train to get on. They even helped us bring our luggage into the train station. These guys were super awesome. I can’t believe all of this was included for $30. So we boarded the sleeper train (approx $100 each) on our way to Aswan. Emo Tours was able to help us purchase them and they accept credit cards. So we boarded the sleeper train and took off to Aswan for Day 2 in Egypt!